Our black stacking chair offers all those essential features needed for seating in offices, events and meetings. It’s stylish black finish and chrome frame fits perfectly into smart locations and the cushioned seat with lumbar support results in a very comfortable hire chair. Chairs with cushioning aren’t a novel idea - in fact you’d have to go back to the mid 17th Century to find seating that mostly consisted of just timber. In the far distant past, chairs were mostly associated with those who had money or were born into the aristocracy. In the 17th Century the design of chairs began to change and suit the demands of the rich upper classes who wanted chairs with upholstery. At this point leather began to be added to seats used by the aristocracy, with silk and velvet following. By the 18th Century the Rococo chair featured cushioning that could be added to removable frames with clips. Popular during the reign of Louis XV were seats that had upholstered backs. During the following centuries designs soon began to match fashions as well as the practicalities of the environment in which they were destined. Different metals were used, and in 1964, a chair was created that was built to be comfortable and very useful for those in offices, public buildings and for events, like conferences, too. Designed by David Rowland, the 40/4 appears as a precursor to our stacking chairs. An upholstered seat set on a chromed steel framed rod, this lightweight product could be stacked a staggering 40-high, and because it was both comfy and practical it became an award-winning model. 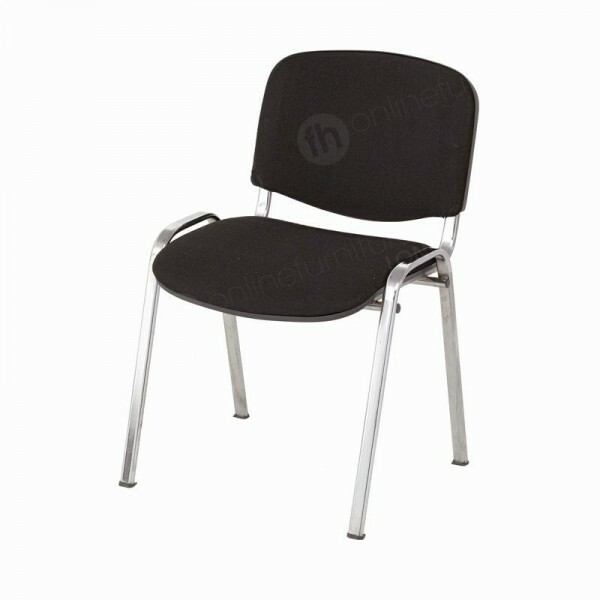 Our black stacking chair encompasses all of these useful features, and more too. It’s the perfect choice for large events where you’d like to showcase the professional image of your company. Its many features make it ideal for big occasions, but another fantastic bonus to this product is that it’s very versatile and is also often ordered for smaller venues as well. We also have blue stacking chairs available too, which are a favourite for many corporate and education clients looking for smart seating. The appearance of this seat, with it’s chrome frame and black finish make it a very popular choice when our clients want to place hundreds - even thousands - in neat rows. When our chairs are arranged in this way they immediately bring a sense of style and class to destinations thanks to the overall look of the product. The classy finish of this chair, draws attention to it’s other top quality features that make this a premium item and one that fits into many top class locations, from Five-star hotels, to boardrooms and corporate conferences. It also matches many of our table hire lines really well, so you can design bespoke office spaces using our range! Our stacking chairs look good, but they also feel great to sit on too! This is down to the high grade materials used in the upholstery. We’ve made sure that our conference seating is really comfy to sit on, so you can be sure that delegates attending longer functions, such as seminars and lectures for instance, are comfortable for the entire length of your event. 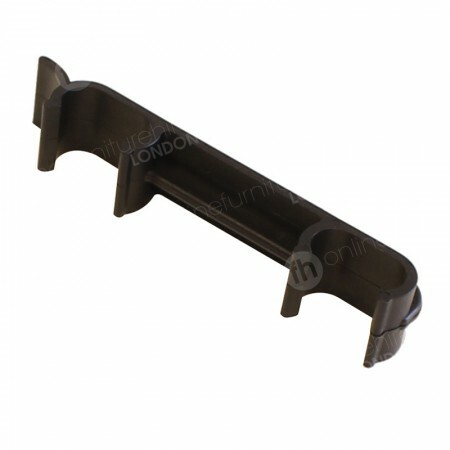 Lumbar support is an additional feature and is supplied by the curved seat back. Comfort and appearance of seating is very important, but so are practical features because chairs that are easy to install, move and store are much more convenient. This product is all these things! This is because of the frame, which results in an item that is both sturdy and lightweight. Being attached to a tubular steel frame, the seat is very secure, but it’s easy to lift as well. So when these products require installation they can be set out quickly and without heavy lifting. This also applies when seating needs to be stored - simply stack them five high and place in storage. 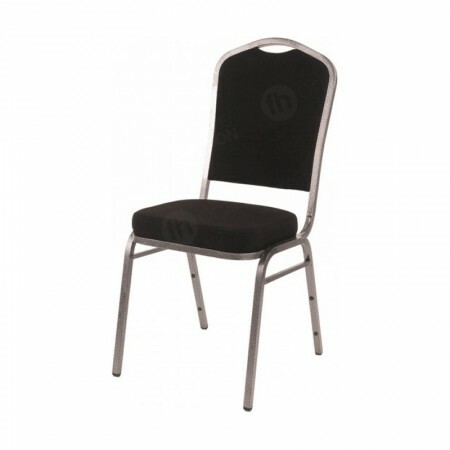 Because of their stackability, these hire chairs help to preserve space in venues, which is essential when this is at a premium. Easy storage means that this product line is a great option when you need to increase or decrease your office seating at short notice, simply unstack from storage when you require them - such as for meetings, training or lectures - and put them away just as quickly. How many black stacking chairs can I order at a time? We have thousands and thousands in stock, so we can meet very large orders for our conference chair - with deals often available on large batches. You can also place much smaller orders if that is what your event requires! Is there a way to secure them at conferences to keep seating looking tidy? A simple way to ensure you keep to fire regulations - by ensuring seating is in neat rows - is to use our linking loops. These link chairs together stopping them from being moved, and keep lines of exit and entry open. Can I easily store them on-site until my event begins? Yes. These chairs take are much less room because you’re able to stack them ten high when they’re not in use. As they are made from tubular steel they’re light to move around too. Do you have them in a different colour? We stock both blue and black stacking chairs - just select the type that suits your function the most, you can even hire in both colours at the same time if your prefer. I’m not sure the exact number of chairs I need - can I order more later? That’s absolutely fine. Simply add to your order nearer the event and we’ll deliver them at the same time. If your event is about to - or has already started - then you can use our same or next day delivery service and we will get you the products you require on time for your event.